The call to try out a tin of Border Biscuits ‘Deliciously Different’ collection could not have come at a worse time. The gym classes had re-commenced, the shopping list was treat free and I was determined to concentrate on slimming down for Christmas (thus enabling me to eat like a hog without guilt over the festive period). But as the postman delivered the fateful tin I knew my plans were doomed. For a brief moment it did cross my mind to ration the biscuits over the course of the week, but in the end I invited a couple of mates round and tanned the entire tin in one session – job done. Established in 1984 Borders Biscuits are a relatively new kid on the block in biscuit terms, but they have certainly made their mark, being sold in almost all supermarkets and indeed across the world. Did they stand up to the taste test? My stand out favourites were the Black Forest cookies; largely due to the generous chunks of cherry and chocolate. The tartness of cherry counteracts the sweetness nicely. Both chocolate based biscuits in the tin had a really light and fluffy texture. Not sure if fluffy is considered correct biscuit terminology but suffice to say it is a good thing. The other ‘fluffy’ biscuits were the Chocolate and walnut brownies (they were definitely biscuits and not brownies). These were lovely but a few more walnuts would have been brilliant. My second favourite in the tin had to be the Lemon souffle (aka Sniffles). 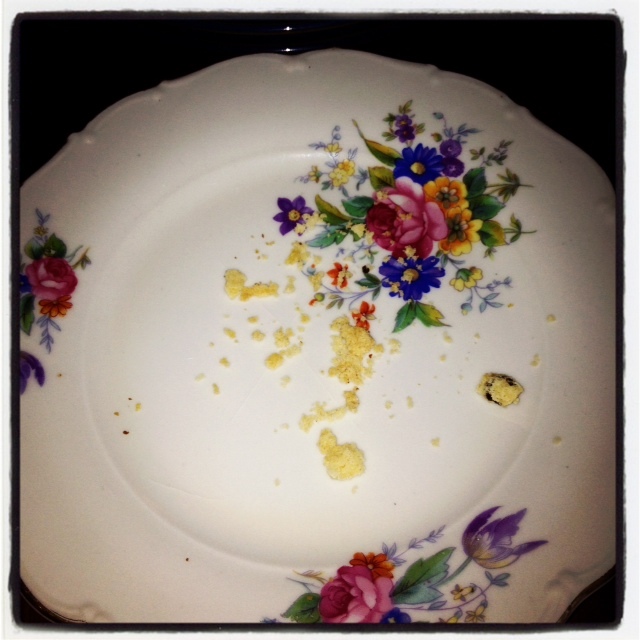 The citrus tang worked so well with the sweet biscuit and it was rather a nice dunker too. Same goes for the Chocolate and orange shortbread – nice contrast and actually quite festive. Toffee apple crumbles – heck what’s not to like really? Thankfully they didn’t “transport me back to childhood with the taste of the fairground”. As a child of the 80’s the taste of the fairground was slimy hot dogs and teeth rotting pink candy floss. I wasn’t blown away by the Strawberry and cream shortbread, a wee bit sickly sweet for me (I can’t believe I am actually saying that!) Although it hasn’t stopped me having another few bites, just to make sure. So is this tin worth buying? The answer is a resounding yes, but only if you are prepared to lose all willpower and demolish them in one go. Not in the box but deserving a special Grumbling Tummy mention is my all time favourite Border biscuit – the Dark chocolate ginger. Spicy, with a great snap – I just love them to bits and will be stockpiling these for the Christmas period. A mild grumble from this Grumbling Tummy is calling biscuits cookies and brownies. I know its a little bit picky and I am not normally a purist but they are brilliant biscuits and proud to be so. 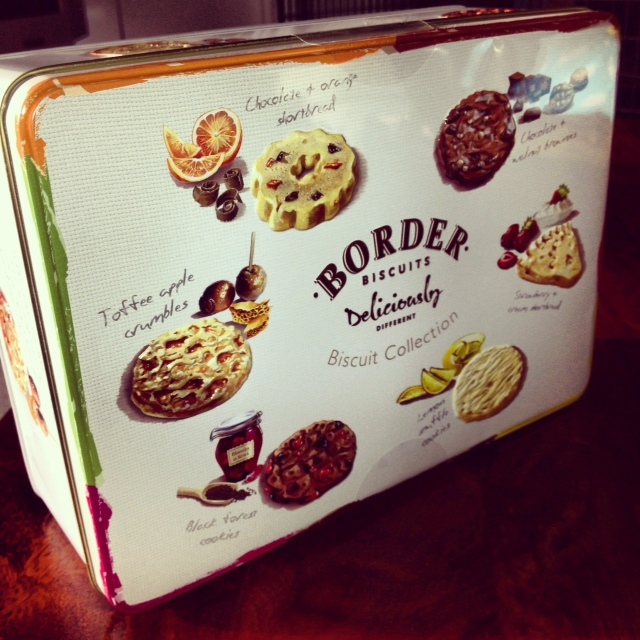 The Border biscuits ‘Deliciously Different’ tin retails at £7.50. Categories: REVIEWS | Tags: fluffy biscuits, food, toffee apple | Permalink. Elizabeth Taylor I hear you gasp. How did such a Hollywood Great manage to keep her culinary passions under a bushel? But of course the Elizabeth Taylor I am writing about is the equally impressive, though slightly less famous Mrs Grumbling Tummy senior. 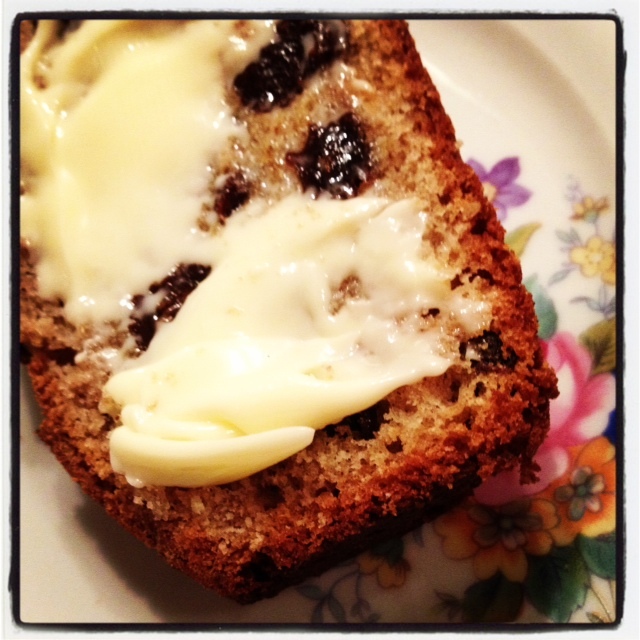 In fact my Dad was the real baker in our family, but as he spent most of the week trawling for fish in the North Sea, mum was forced to master some simple but fabulous recipes to keep the home fires burning and one of these recipes was for Fruit Loaf. Although I am a first class cake eater, I rarely make cakes. You see all to often things go horribly wrong – my daughters first birthday cake is still referred to as the birthday pancake. Perhaps my cooking style does not transfer well to baking, which is altogether a more scientific beast. I favour the ‘dab of this and dash of the other’ approach to cooking and rarely stick religiously to a recipe. Besides attention to detail was never my strong point. However that said, every man and his dog seems to have been bitten by the baking bug lately, and not wanting to be left behind, I decided to give it another bash. 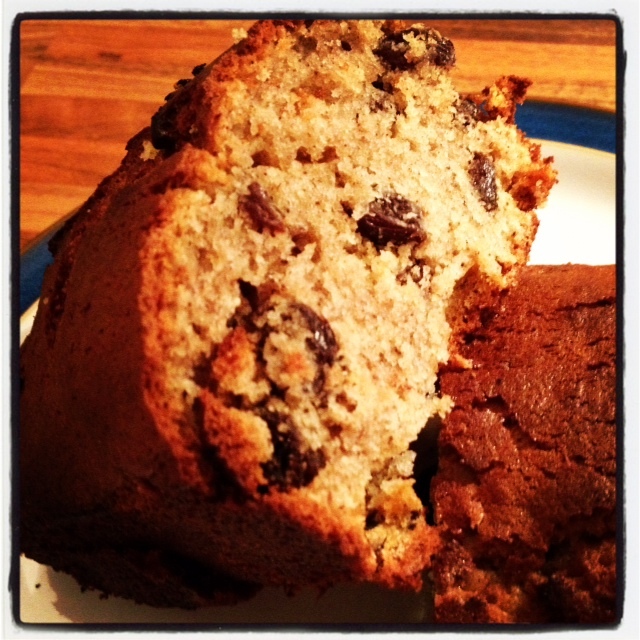 So what better cake to make than my mum’s fruit loaf? It is the easiest and tastiest cake imaginable, thus ensuring that my fragile ‘bakers’ ego remains intact. Apart from being a little more cakey than loafy it pretty much does what it says on the ‘loaf’ tin, delivering a fruity and spicy offering that tastes equally great on its own or further enhanced with a slab of butter. 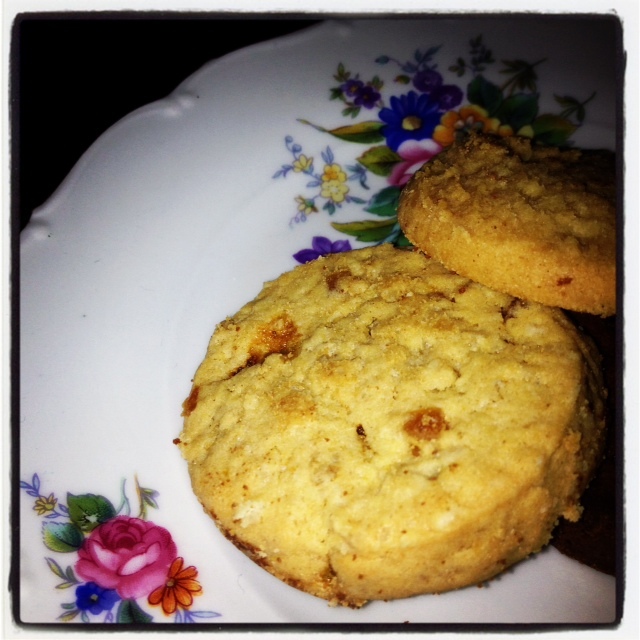 Categories: MUSINGS, RECIPES - BAKING | Tags: cooking, food | Permalink. 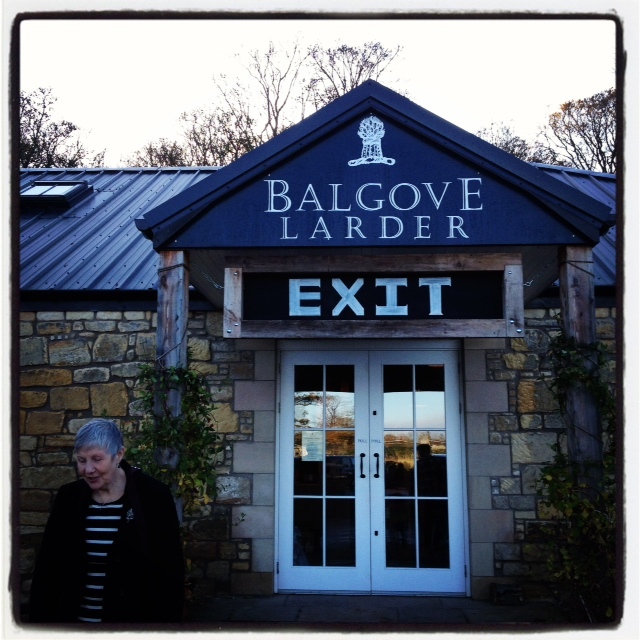 Balgove Larder in St Andrews has been on my hit list of ‘restaurants I must try’ for some time. I did attempt to lunch there once before but unfortunately it was not to be. A perfect storm involving a grumpy and very tiny baby meant that we were there for all of 5 minutes before being forced to make a hasty retreat. It has taken me a year and a half to make a repeat visit and I am so glad that I did. The weekend before last granny, grandpa, maw, paw and the wean descended on Balgove Larder to celebrate my birthday and our fifth wedding anniversary. Farm shops for me are what Tiffany’s was for Holly Golightly – they can chase away the mean reds. I love browsing and sampling the often pricey but almost always delicious offerings in the shop areas and the food is generally speaking excellent. The restaurant area in Balgove Larder is on the small side but very popular, which meant that I had to bypass the shop experience this time (all the more reason to return) and go straight to the main event. The menu oozes fresh, local produce and it was pretty hard to choose from the fantastic selection available. 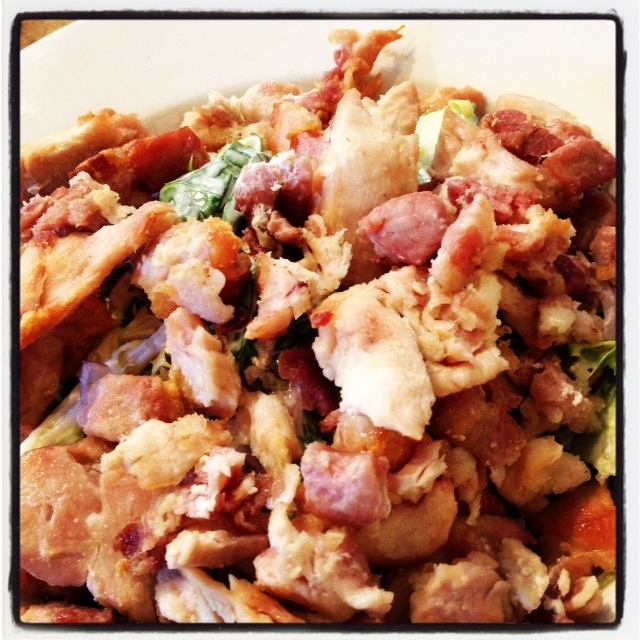 I finally opted for a chicken and bacon salad with blue cheese dressing. I have had a few chicken and bacon salads in my time and they are so often disappointing affairs; usually this is down to unseasoned bland breast meat. Not so at Balgove Larder. The chicken was bloody marvellous – a little bit buttery, a little bit salty and a little bit browned which made it a big bit tasty. There was luscious little chunks of bacon rather than a few snipped up rashers and the quota of meat to salad was very generous indeed. The blue cheese dressing was not overpowering and complimented the dish beautifully. Chicken and bacon salad may seem a little pedestrian to some but trust me this was the best chicken and bacon salad I have ever tasted. I was too involved in my meal to taste the beef stew which BC was tucking into but it looked amazing and BC reported that it hit the mark. Needless to say I didn’t stop there. The chocolate brownie I chose to follow was divine although to my mind most chocolate brownies deliver a little piece of heaven. 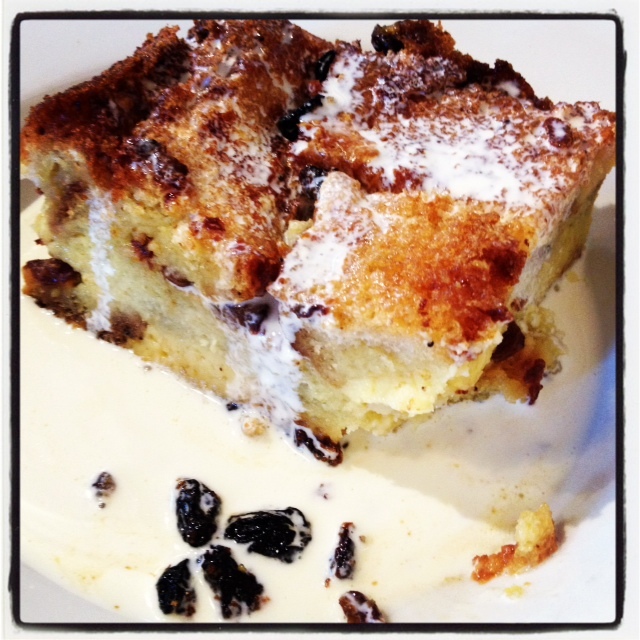 However the star of the ‘afters’ show was the bread and butter pudding chosen by Grumbling Tummy Senior. He is getting on a bit and his appetite is not what it was so I didn’t hesitate to help out (a lot) . Served with pouring cream this was a first class bread and butter pudding. Brown and crispy on the top and soft, sweet and fruity underneath. 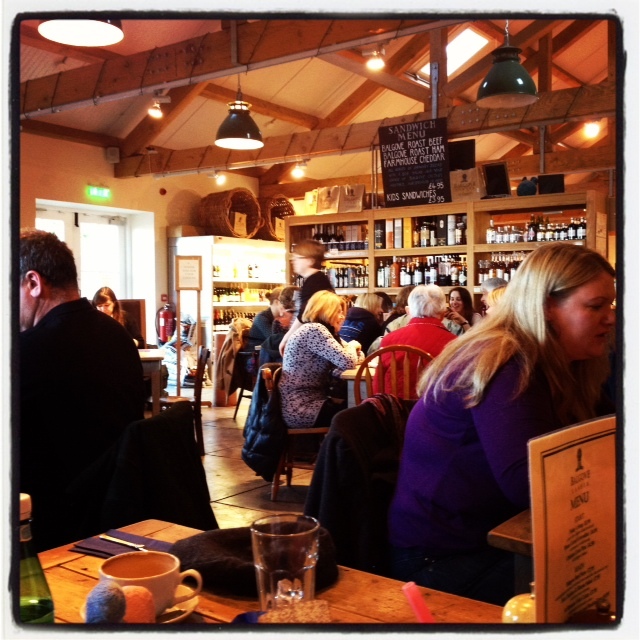 The interior décor of Balgove Larder is what one would expect, and indeed hope for in a farm shop. Immaculate, rustic and tasteful. As I mentioned before, the restaurant area is not large and Balgove Larder has a good reputation – so get there early if you want a seat for a weekend lunch (they don’t take bookings). 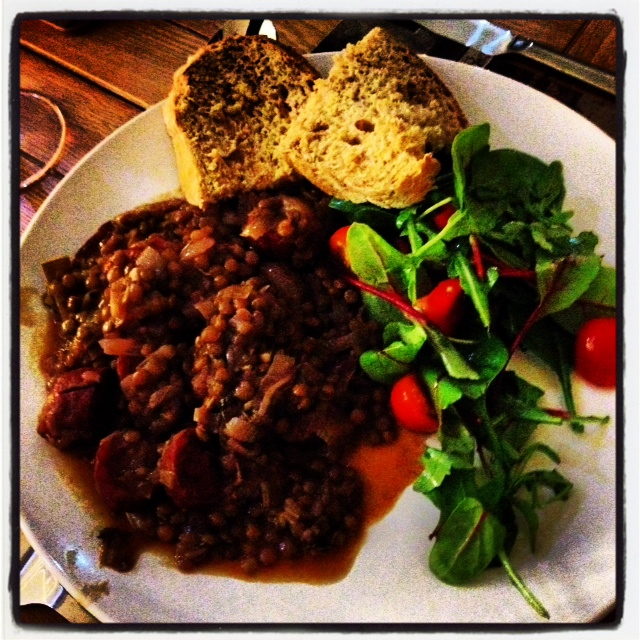 Having just watched the first in the series of Hugh Fearnley Whittingstall’s “3 Good Things”, I felt inspired to share a recipe with you that uses not three but four of my favourite ingredients to make a Grumbling Tummy classic: chorizo, onions, lentils and red wine. 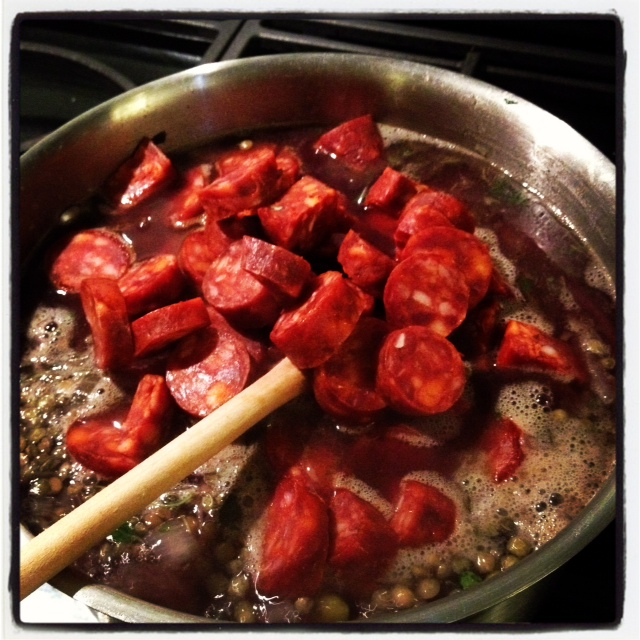 The official title of this dish is “Lentils with red wine and Chorizo” and it has become one of my favourite dishes to make when I have people coming round for lunch. It is simple, earthy and ridiculously tasty. Amongst close family and friends this dish is also affectionately known as “disgusting brown sludge” – charming! On first serving this dish to BC he pronounced that it looked “disgusting” before delving in, finishing it and asking for seconds. Just goes to show that looks aren’t everything. Another friend thought disgusting was going a bit far but did agree that it looked rather like “brown sludge” – again this was before tucking in and proclaiming it an outstanding success. And so the moniker was born. I made this hearty one pot on Friday for friends who joined myself and BC on our anniversary/birthday weekend to St Andrews. The entire Grumbling Tummy contingent coming down with their first winter cold cast a slight cloud over our long anticipated get away . Taste buds were compromised and this dish packed the flavour filled punch that was needed. 4 onions, 2 leeks, fresh thyme, 300g lentils (puy or green), around 350g of cooked chorizo chopped up, 1 litre of chicken stock, 2 very generous glasses of red wine and a handful of chopped parsley. 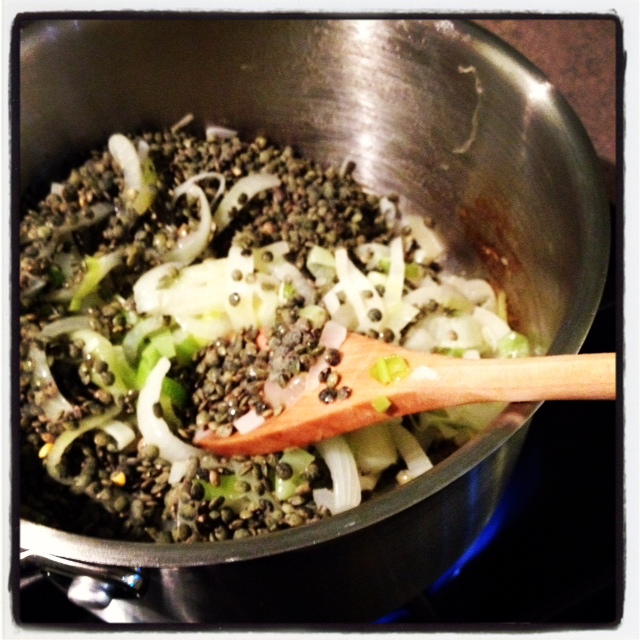 Simmer away for around an hour – keep tasting to make sure your lentils still have some bite and have not turned to moosh. Add the parsley and serve with lots of crusty bread and salad. The original recipe came from www.bbc.co.uk/goodfood but I have tweaked it quite a bit. I have doubled up the chorizo as I found the original recipe a little bland for my taste. I also tend to add the chorizo in near the get go so that the juices penetrate the whole dish, then I cook it for twice as long as the original recipe suggests. Give it a bash and let me know what you think.